Dying isn’t dead, it’s a stage of living, difficult yes, but so are other times of our lives. Patients who are terminally ill and want to commit suicide are often relieved later that they changed their minds or didn’t succeed at self-destruction–just like other once suicidal people. Studies show this repeatedly and I have met such individuals. When society supports the terminally ill in committing suicide–by legalizing access to lethal means and by not engaging in prevention in the same way we do other categories of suicidal people–it sends an insidious and hurtful message that the lives of the dying are less important, and that their families and the rest of us are better if they do die sooner rather than later. I know, I hear from such wounded people on an ongoing basis. 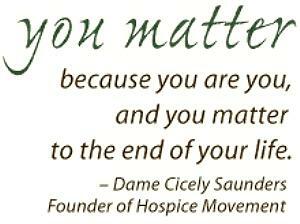 Facilitating the suicides of patients in hospice completely subverts that hospice philosophy as established by the great medical humanitarian, Dame Cicely Saunders. Once society generally accepts suicide as an answer for one aspect of human suffering–experiencing a terminal illness–it will sooner or later expand access to being qualified to be made dead, e.g., people with disabilities, the elderly, the mentally ill, as has happened in Netherlands and Belgium. I get that people think they are being compassionate in supporting the legalization of assisted suicide. But they are not. Unintentionally, they are abandoning the dying to their worst fears about being burdens, being less loved, and losing dignity. More bluntly, they are telling the dying that their lives are not really worth living.